Coding and development have become an inherent part of the digitized world today. From apps to websites every aspect of the online domain is nothing but coded or programmed software. Are you interested in learning python programming? Then Intellipaat Python Online Training is for you. With changing user needs and digital environment the techniques and tools of development have also gone a change. This has seen an adoption and updation of a number of coding and programming language in face of Python, Java, C#, Ruby, C++ etc. Each of the languages suits best with a specific kind of development needs (and other development needs as well). Say for mobile app development Java and C# are preferred for Game development C++ and C# are popular and for Desktop based application Java, C++, and Python are preferred. However, certain coding and programming languages like Python have found a general level of acceptance. That is a language like Python are preferred for most of the development and programming needs. Python development or Python based coding has seen an increase in the number of takers since its inception in 1991. Firms looking for development solutions opt for Python Development more often than not these days. This, as a result, has increased the demanded professional coders who can code and script in Python based development project. Ever wondered why Python development has been preferred so, much or what can be the main reasons behind the use of Python. Well, if you have (or even if you have not thought about it) thought about it then here comes the answer to your question. We would now look into the reasons that why one should use Python (or you can say the reasons behind its effectiveness) for development purposes. Don’t hang on keep on reading till the end to get the answer. 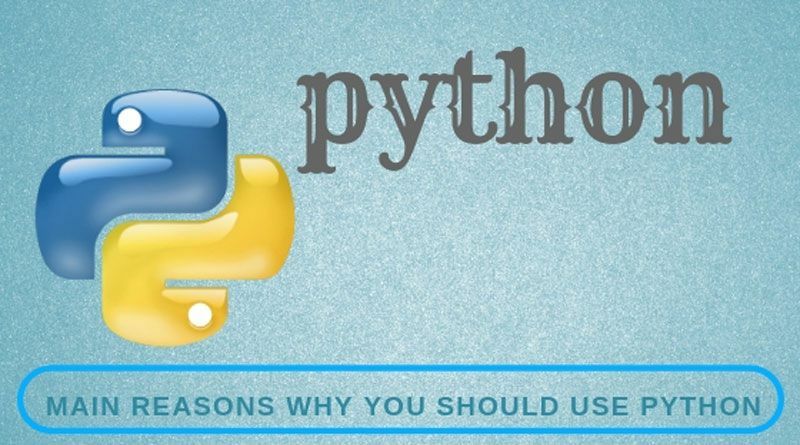 Before we go on to look the reasons as for why you should use Python for development purposes it would be better if we first get a general idea about what Python is actually (of course is a coding language but what are its technicalities). Python happens to be a high-level, interpreted, general-purpose programming language that can be used for the app, software, website or any other kind of development. Released in 1991 the language has a design that lays emphasis on readability, notably with the use of significant whitespace. Python provides constructs that enable the coders to program clearly on both small and large scale. Python among other coding and programming languages has that capacity of delivering fast, effective and efficient performance. The new modification and updates that have been bought in the language over the years have done a good job in terms of enhancement of its speed. Tools like Numba offer some amazing speedups by implementing functions written in Python. In this fast-paced world where everything is just a click away Python’s fast performance makes it a popular development tool. Python shows a really effective performance when it comes to graphic user interface development for mobile or desktop applications. Developers use Python commonly in projects that are either small or large in nature and require sufficient depth and details on the graphics front. The ‘Tkinter’ library that Python houses make it easy & smooth to develop applications. Python is also preferred in game development for writing logic. Now, compatibility is the one reason that can best explain to you why Python development is in demand among firms looking for development solution. The effective compatibility of Python with almost all the mobile OS (Operating System) makes it popular in app development. Moreover, Python allows developers to run code in multiple platforms without the need of recompilation. This allows for the ease of making adjustments and modifications without building on the development time. 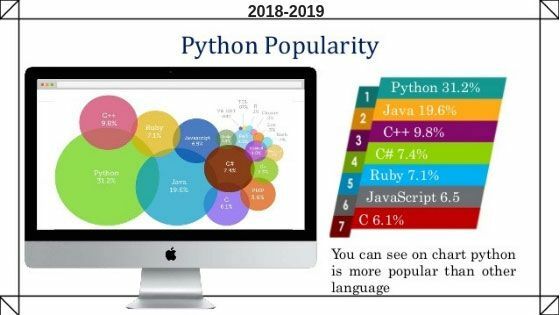 Python’s numerical engines like the Numpy or the Pandas have mad Python the language of Data Scientists over the years. We all know that data is the gold of the digital world and proper analysis, assessment and understanding of data is the key for enhancing revenue generation. The ease of usability that Python accords to Data Scientist make it a popular ‘to use language’. As per a finding, around 39% of data scientist preferred Python over other languages. Big Data has been a buzz word in the online domain these days. Since the popularization of Big Data Python has significantly enhanced its ecosystem and support network. Python among other advantages brings in a matured and effective numeric and scientific computing ecosystem. Rich data community and a large number of toolkits as in-built features make Python a powerful tool for processing of data. Python also supports parallel computing allowing it to be used for Hadoop as well. We, hope that you might have got the answer to the question that why to use Python as your language. So, what are you waiting for go ahead and develop your desired project in Python. Sunny Chawla is a Marketing Manager at AIS Technolabs. Web-design and Development Company, helping global businesses to grow in the online market. He would love to share thoughts on WordPress Development, Mobile App Development, Digital marketing etc..
You may like: How to boost visitors on a website for higher ROI?